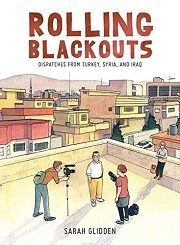 In 2010, cartoonist Sarah Glidden traveled with journalist friends Sarah Stuteville and Alex Stonehill through Turkey, Iraq, and Syria. The journalists, founders of the Seattle Globalist, were there to meet and interview people and develop stories for their website and other publications. They weren’t sure what they would get, but this type of travel had worked for them in the past, and they had contacts who could help them meet refugees and others with stories that don’t often get told. Along for the trip was Sarah Stuteville’s friend Dan O’Brien, an ex-marine and Iraq veteran. The idea was that Sarah S. could build a story on what it was like for Dan to return and to meet people affected by the war in Iraq. Sarah Glidden was there to document the trip, focusing on the process of journalism. So this book offers both perspectives on life in these countries and perspectives on the work of communicating about those lives to American audiences. The refugee stories are, naturally, pretty fascinating. Most of the people the journalists meet were middle class, but war (not just the Iraq war but others before it) forced them to give up their resources and become poor. I wonder now what happened to those who were too poor to escape. The stories vary in their particulars, but common threads emerge. A good life, some unease, then a crisis that made it impossible to stay. And now they wait for a permanent home. One particularly complex story involved a man who made it all the way to the U.S., where he lived for years, raising two children in Seattle. But a chance meeting connected him to the 911 plotters, and he was deported back to Iraq. Despite what happened, he continues to love America, and he hopes to return someday. The journalists struggle with how hard to push him on his story. They have read documents from ICE, and they know that the lies on his initial immigration form were more extensive than he claimed. Is there value is pressing him? Will it add to the story they want to tell? Will they even use the material from their interviews with him? Even more complex is Dan’s involvement. Dan was against the Iraq war, so it was a surprise to everyone when he enlisted. Throughout the trip, Sarah S. interviews him repeatedly, trying to understand how being back is affecting him and what he thinks now of his time in Iraq. She’s frustrated that he expresses no regrets, that he focuses instead on how much better life is for the Iraqi Kurds that they talk to about the war. Is he clinging to their stories out of guilt? What will happen when they get to Syria and meet Sunni refugees there? Is it right to push him toward some sort of epiphany? And what if he doesn’t get there? Is it even ethical for Sarah to have turned a childhood friend into a journalism subject? This story got a little tedious after a while, but it raised some interesting questions about journalists’ expectations when going into a story and their subjects’ suspicions about the work. One of the things that comes up repeatedly is how much digging journalists have to do to even get at a potential story, much less one that they can develop and sell. Some really interesting stories are difficult to sell, such as the one about poor Kurdish refugees living in a former prison. They think they’ve sold it to The World, but it’s rejected as too dark. Interestingly, Sarah Glidden’s cartoon work about journalism means that the story gets told, albeit briefly and as part of a larger story. The book is presented in a comic-book format, a medium I’m finding really terrific for journalism. (See especially Joe Sacco’s amazing work.) Sarah Glidden’s drawings are in color, with soft muted tones. The art isn’t splashy, and the nature of the story means that there are a lot of talking heads with speech bubbles. It’s not as interesting to look at as some of the nonfiction comics I’ve read, but that might be fitting because so much of the work she documents involves sitting in nondescript rooms and having conversations. The book is at its best when it focuses on the people the journalists meet, but I was interested in the questions about journalism that the book raised, so I wasn’t sorry to get that behind-the-scenes look. The approach of the Globalist team is apparently not the norm, however, so its value as a study of journalism is limited. It is a book about these journalists on this trip after these stories, and I appreciated it for that. Near the end of the book, Sarah S. talks to Sarah G. about her goals for her work. Sarah G. is frustrated that their stories aren’t making more of an impact. And Sarah S. says that her goal isn’t to create change. Instead, she asks herself, “Is it better that this story is out there in the world than if it wasn’t? 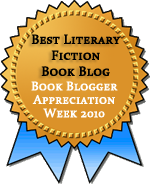 If the answer is yes, then you do it.” After that, it’s up to the reader. I think that applies to this book, too. It’s good that this story is out there, even if there’s no clear lesson or easy answer to come from it. I first learned about this book from Aarti, who shares my interest in this kind of journalism. You should check out her review, too. Thanks, Aarti, for the recommendation! Oh, I’m so glad you read and reviewed this! You’re so right about the funnel that journalists must go through in finding stories, determining whether they are compelling enough, figuring out how to pitch them, and then finally telling the story. The conversation about how to pitch stories was so fascinating, too. Thank you for alerting me to its existence! I really appreciated seeing their frustration at having to abandon great stories because they didn’t fit anywhere. This sounds great, and I love the format! I’m adding it to my list right now. Thanks for sharing. The comic format is wonderful for journalism and other kinds of nonfiction. Hope you enjoy!